The temple is among the 108 divyadesams of Srivaishnavas and comes under Choza naatu divyadesams. 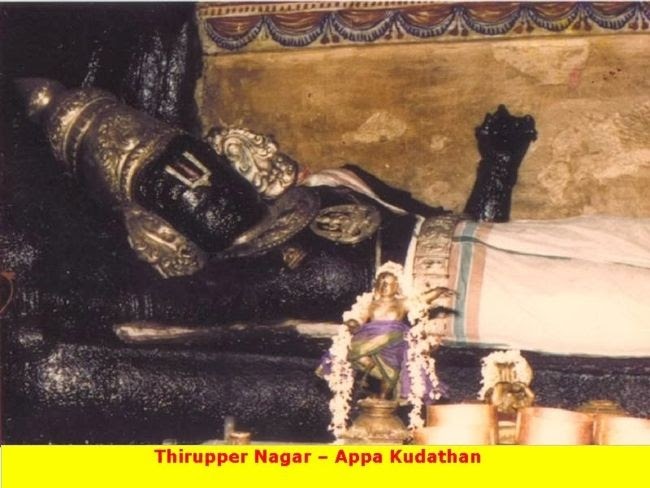 The presiding deity is Lord Appakkudatan or Lord Appala Ranganathan in reclining posture with a pot full of appam (a sweet) besides him and thayar is called Indradevi or Kamalavalli thayar. 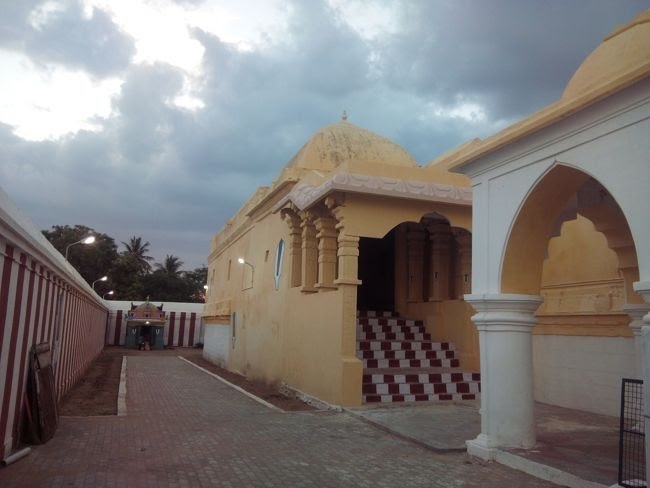 Nammazhwar is said to have recited his last paasuram in praise of the Lord in this temple before attaining moksham. The temple is said to be older than Srirangam Ranganathar temple. It is called Koviladi as it is believed that Sri Appala Ranganatha perumal measured the steps for the periya kovil from here. The temple is among the Pancha Ranga kshetram, the others being Srirangam, Thiru Indalur, Srirangapatnam and Kumbakonam. 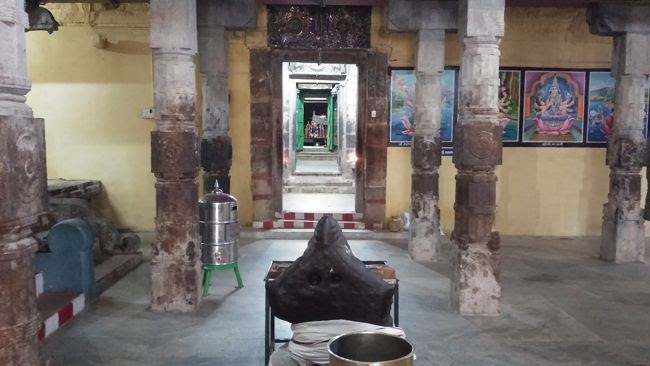 Appala Ranganathar temple is at least 2000 years old. This temple is 6th among the 108 Divya Desams. The most important 108 Vishnu temples in south India is called as 108 Divya Desams or 108 Thiruppathi. Every day evening “Appam” (pancake) is offered to the Lord Vishnu so he is called as “Appa Kudathan”. At this temple lord Vishnu is holding Appam in his right hand. King “Upari siravasu”, Markandeyan and Indra worshipped at this temple and got their problems resolved. This temple is considered to be one among the five sacred houses of Lord Vishnu. Only in very few temples Lord Vishnu is appearing in a sleeping position and out of that, five temples are considered as sacred houses. They are (01) Aadhi Rangam – Sri Rangapattinam (Mysore) ; (02) Appala Rangam – Koviladi (Tanjore) ; (03) Mathiya Rangam – Sri Rangam (Trichy) ; (04) Chathurtha Rangam – Sarangapani Temple (Kumbakonam) ; (05) Pancha Rangam – Mayiladurai Vishnu Temple. 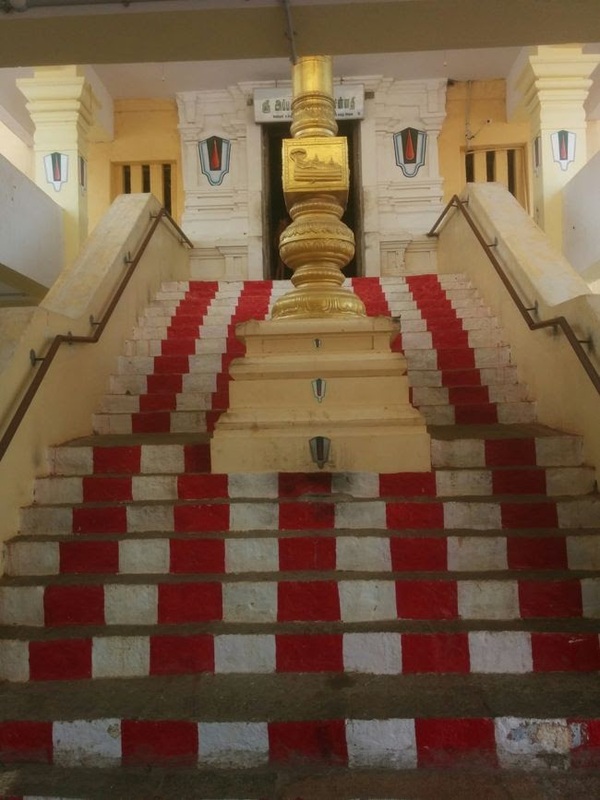 If devotees worship this five temple that is equal to worshipping the 108 Divya Desams. Sri Devi appeared at this temple before Vishnu came. 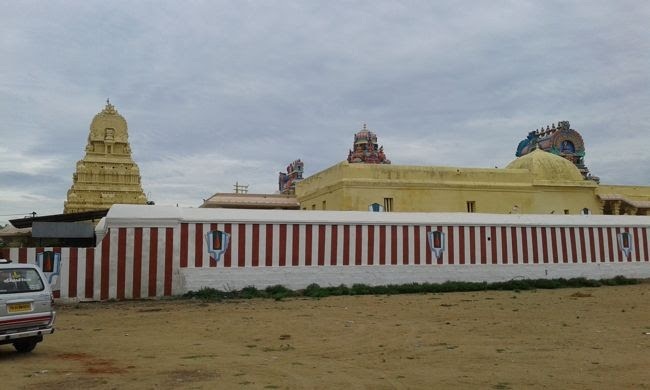 Four different Azhwars have sung songs about this temple. This temple is located at a place Koviladi and also called as Thiruper Nagar. It is believed that Nammazhwar after sung about this temple attained moksha from here. Devotees to overcome the fear of death, married couples facing difficulties to have child, facing different curses can worship at this temple to overcome all their problems. As it is a very old temple it is called as “Appala Rangam” and also it is older than Sri Rangam temple it is called as Appala Ranganathar. Lord Maha Vishnu is appearing in the sleeping position and facing the west direction. Sri Devi is residing at Vishnu’s heart. Markandeyan is sitting next to them. Kamala Valli Thayar is located in a dedicated Sannidhi. In the inner prahara the other gods like Garuda, Ganesha and Azhwars are located. This temple was constructed and renovated by different kingdoms. The architecture of the temple is representing the Chola, Pallava and “Vijaya Nagara” style of construction. Sri Devi appeared at this temple before Lord Maha Vishnu arrived here. There is an interesting mythological story behind this. Once at Vaikunda there was a debate about who is better in between Sri Devi and Bhooma Devi. The final result of the debate favored the Bhooma Devi. Sri Devi got angry about it and she came down to earth from Vaikunda. Sri Devi came down to “Thiruper nagar” and started performing the penance to get peace at her. Later Lord Vishnu also came down and convinced her importance in the world. He accepted her in his heart and that is why Sri Devi is in the chest of Lord Vishnu at this temple. This entire drama was taken place to have Lord Vishnu at Thiruper Nagar. As per another historical story there was a powerful Pandya king called Upamanyu. One day when he went for hunting and he saw a mad elephant was entering into Rishi Gowthama’s ashram. He arrowed on the elephant to kill it. The elephant became wild and it killed one Brahmin who was reading the Vedas in the ashram. So the king Upamanyu got a Brammahati Dosha. To get rid of his Dosha he visited several temples and he finally reached Koviladi Appala Ranganathar Temple. When he reached this temple he felt refreshed and improved in his health. Then he checked with his guru what the specialty of this temple is. Guru explained him that even for Indra who was chased by Asuras due to Dhurvasa Rishi’s curse and he got cured his problems only here. He advised king Upamanyu to stay at this temple and worship the Lord Vishnu. King stayed at this temple and donated food for thousand Brahmins every day. Lord Vishnu saw the king’s dedication and he wanted to cure his curse. One day early morning, a Brahmin arrived at King’s place and asked for a food. King also did his morning rituals very quickly and started serving the food. That Brahmin ate all the food prepared for that day and he still claimed only half of his stomach is full. King replied that to wait for some more time. He will once again cook and serve the Brahmin. The Brahmin who arrived is none other than Lord Vishnu. Vishnu told him he is very tired so he is going to take rest. He asked him to bring the Appams in the evening and he went. On that day evening king Upamanyu carried a pot full of Appam and reached the Brahmin to eat. He picked one Appam from the pot and laughed at him. The king felt totally divine at that moment and realized the Lord himself arrived in the form of Brahmin. Then Sri Devi who was performing penance also showed her appearance to the king and he got cured from his curse. Hence every day evening the “Appam” are offered to Lord Vishnu only at this temple. The temple is situated in a tiny village of Koviladi on the banks of river Kaveri. The Moolavar, in a reclining pose is known as Appa Kudathan and here we find Markendaya muni near the Lord. 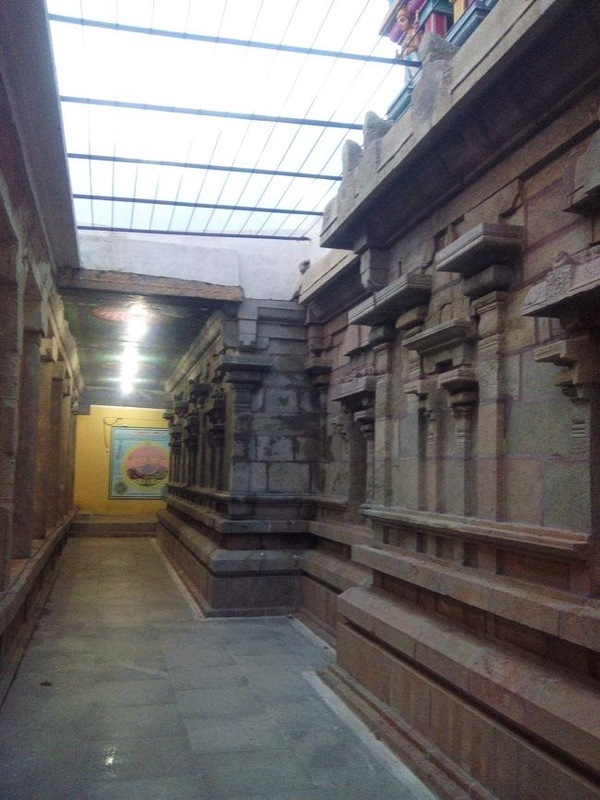 This temple is considered to be older than Srirangam temple. There is a huge silver pot, the appa kudam (A sweet made of rice) near the Lord's right hand and it is believed to be full of appam as this Lord is fond of the same. Another highlight of this temple is that those who are childless come here and pray to Appakudathan. The archakar (priest) gives the would be mothers , a small beautiful idol of Santhana Gopala Krishnan to hold on their hands. She is also given tulsi leaves as prasad, which she will have to keep it in the pooja room and perform pooja daily, and they are in due course blessed with a child.The blessed couple take back the tulsi leaves to the temple and offer it back to Appakudathan as thanksgiving. Koviladi is located on the Thiruvaiyar Kallanai Road. It is about 9 Kms from Thirukattupalli, 7.5 kms from Grand Anicut or Kallanai, about 24 Kms from Srirangam and about 35 Kms from Tanjore. 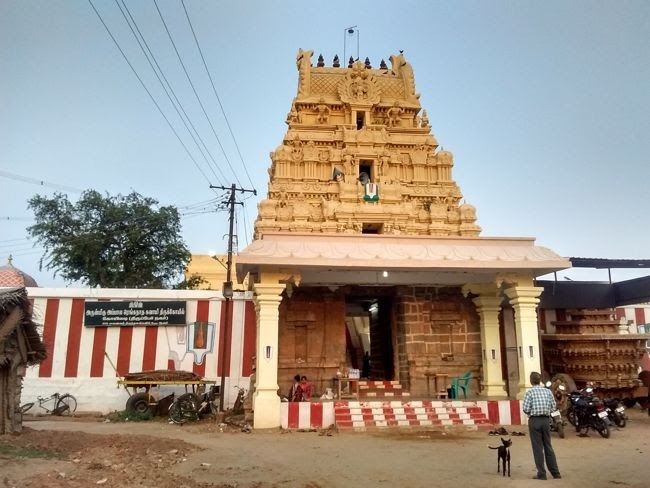 Grand Anicut is a very scenic spot where you can plan to spend some time if you are going to this temple as you have to pass through it if you are going from Trichy/Srirangam. Grand Anicut is one of the engineering marvels and is probably one of the oldest dams in the world built by Karikala Cholan around the First Century AD. This whole stretch between Kallanai and Thiruvaiyar is really beautiful and enjoy riding on this stretch a lot. The lush green fields on either side of the road is very scenic. This stretch is very fertile land as it lies between the two rivers Cauvery and Kollidam. Anyone will fall in love with this stretch.